Punters enjoyed a good round last week but there were still some upset results in the mix. Stormers and Jaguares were upset winners as this Super Rugby season continues to surprise. We have free tips, form and odds for all six Super Rugby Round 10 games, starting with the Chiefs vs. Lions on Good Friday. The Chiefs have started to look like a premiership-winning franchise after stringing some wins together. They come into this game haven’t beaten the Blues in a thrilling contest last week. 2019 hasn’t been your typical year for the Lions. They have been a model of consistency over the last few years but they been moderately awful this season. A 31-20 loss to the Brumbieslast week could be the tipping point for their season and they could further implode from here. We’ll take the odds for the Chiefs head-to-head here. The Sunwolves enjoyed a week off after getting thrashed by the Rebels in Round 8 and they will have needed all the time to prepare for the Hurricanes. Also coming off a bye, the Hurricanes were 31-28 winners over the Highlanders in Round 8 and they’re another team which should be starting to hit their straps. Playing against the Sunwolves plays right into the hands of the Hurricanes, who like to play an up-tempo style and counterattack rugby. That’s the same as the Sunwolves, except the Hurricanes are better at it. Bookmakers have set the line at 16.5, which might not be enough for the Japanese-based franchise. The South African conference has been tough to predict this season, which was evident with the Sharks losing 51-17 to the Jaguares at Kings Park Stadium last week. Sharks were disappointing after looking good in rounds prior and the Reds looked just as bad when going down to the Bulls 32-17. The difference between the two losses was the Sharks loss came on home soil, whereas the Reds had to make the long trip to South Africa. They will be better with a week under their belt at altitude and they could give this current Sharks team something to worry about. This is shaping up to be a classic Kiwi contest as the Highlanders and Blues look to shake off recent losses to Kiwi teams. 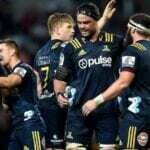 The Highlanders lost a close game to the Hurricanes in Round 8 before getting a bye last week and the Blues were narrow losers to the Chiefs. We thought the Blues played well enough to beat the Chiefs last week but they didn’t take their chances. It was made a close game late thanks to come consolation tries, but they needed to take their chances earlier in the game. Highlanders are always tough to beat at home and much like the bookmakers, we’re expecting a close game. We’re not sure what to make of the Rebels’ dismal performance against the Stormers last week. It was out of character for the top Australian side and they will need to turn things around quickly. Waratahs had a week off to recover from their 32-29 loss to the Blues in Round 8 and considering what has happened off the field this week with Israel Folau, this could be a tough week for the Australian side. Rebels enter enemy territory needing a win to restore their confidence and we think they can get it done. Stormers were brilliant 41-24 winners over the Rebels last week and they could continue that momentum against the Brumbies. The Brumbies were also good winners when scoring a 31-20 win over the Lions last week and their offense looked good. The same formula will be used against the Stormers this week but it won’t be as easy playing in South Africa. Consecutive wins could be in order for the Stormers.